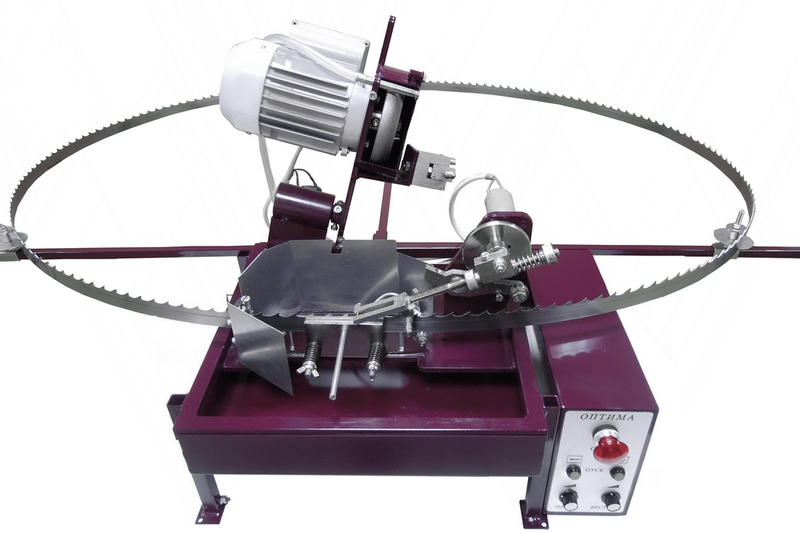 ПЗСЛ 10/25 - PZSL 10/25 is an automatic borazon machine for sharpening of furniture bandsaws with width of 10-25mm by profile borazon wheel, with oil cooling and without presence of experienced service man. Bandsaws with width of 10-25 mm are used at many factories. Almost always cutting edges of saw teeth become blunted fast and a saw is subject to throw out. But it, as any other tool, can be turned and used several times in operation. Please calculate economy of your production. And if you decide that it is more profitable to use a saw several times just by re-turning it without throwing it off and buy every time a new one, please contact us for purchase an automatic sharpener. Any person without special qualification may operate this machine. It provides an ability to exclude an influence of human factor on a result quality. A service man is required to bring a wheel closer to the saw. Other operations will be done by a machine itself. You will get a saw of factory quality by one pass with absolutely same profile of every tooth and required face and back angles along full length of saw without burns, microroughnesses and machining marks. Usage of this machine will allow increasing the resource of saws in several times.